Our new pharmacy is a stand-alone building, centrally located in the hospital compound. It's been designed and built so that all the functions - managing, receiving, storing, and serving patients - will all be more efficient, faster, and easier for everyone. Patients will get medicine easier and quicker, our pharmacy staff will have a simpler task managing stock, and everything is more streamlined. 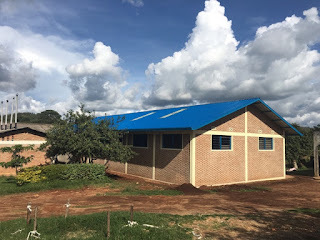 Just one more support service that may be less obvious than a new surgeon, or a new pediatric building, but still a critical step towards competent, compassionate care at Kibuye Hope Hospital.